Deciding on the right SUV can be exciting, especially if you’re considering the 2018 Volkswagen Atlas vs. 2018 Ford Escape. Both SUVs offer a lot to their drivers, but when it’s time to decide, you need to choose the one that’s right for you. That’s why our team at Volkswagen Lee's Summit is here to help drivers in Lee Summit, Overland Park, and Olathe learn more about these vehicles so that they can determine their best options. On top of providing additional gear ratios, the VW Atlas can deliver 235 horsepower and 258 lb-ft of torque. This far exceeds the 168 horsepower and 170 lb-ft of torque that the Ford Escape is capable of producing. Each SUV offers spacious cabins that provide a roomy experience for their respective passengers. The Volkswagen Atlas provides three rows of seating for its seven passengers, while the Ford Escape features two rows and maxes out its occupancy with five passengers. The VW Atlas also has the advantage with space, with its 41.3 inches of headroom in the front and 40.4 inches of headroom in the rear. The Ford Escape is a little cramped with its 39.9 inches of front headroom and 39 inches of headroom for its rear passengers. The VW Atlas has a commanding lead with its offered cargo space, as well. When the second and third rows are folded down, you get 96.8 cubic feet of cargo room. Meanwhile, when you fold down the second row in the Escape, you only get 67.8 cubic feet of cargo space. There are some noticeable differences with the 2018 Atlas vs. 2018 Escape, especially in the entertainment features category. Each SUV provides a 6-speaker sound system, so that every passenger can enjoy the music from anywhere in the cabin. Each vehicle offers a display screen, too. However, the 6.5-inch color display in the VW Atlas is larger and more user-friendly than the 4.2-inch screen in the Ford Escape. Additionally, both vehicles feature radios and USB/auxiliary inputs for external media devices. The VW Atlas also includes the Volkswagen Car-Net® App-Connect, which integrates your smartphone into the touchscreen so that you can easily access your apps and contacts while on the road. In this comparison, you certainly learned a lot about how the 2018 Volkswagen Atlas vs. 2018 Ford Escape differ. You saw the comparisons of these SUVs with their respective performances, offered cabin space, and even the entertainment features. 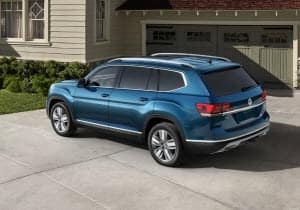 But if you’re still uncertain, you can always take a ride in the 2018 VW Atlas to get a better feel and more insight, so you can be sure. Schedule a test drive with us at Volkswagen Lee's Summit. We’re proud to help drivers in Lee Summit, Overland Park, and Olathe on the journey toward the right SUV.